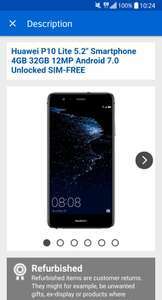 Came across this and it seems to be a very good price for a refurbished handset from a main retailer, B grade from CEX is £195. Yeah I went with the cpw offer too for the missus. Despite a bit of a hoohah in store everything went well. Paid the 15 for one month with the hope of cashback paying out. It isn't so your post is pointless. I'm sure nobody's going to go for a refurb if they see my post. They'd instead wait for the CPW deal or similar to return - unless they're desperate for a refurb P10L. So, it's hardly pointless. Your reply to me is the pointless post here. Having a bad day, are you? A great phone but I think I'd rather pay an extra £35 or so for a brand new one. I'm sure nobody's going to go for a refurb if they see my post. They'd …I'm sure nobody's going to go for a refurb if they see my post. They'd instead wait for the CPW deal or similar to return - unless they're desperate for a refurb P10L. So, it's hardly pointless. Your reply to me is the pointless post here. Having a bad day, are you? You're never going to get that cashback, you need to stay with them for 3 months. You're never going to get that cashback, you need to stay with them for 3 …You're never going to get that cashback, you need to stay with them for 3 months. Can't see anything anywhere in the T+Cs that mention minimum term of 3 month. If it pays out cracking then if not not really fussed as the phone is well worth the full price. Crossbow your having a bad day too I take it? A great phone but I think I'd rather pay an extra £35 or so for a brand …A great phone but I think I'd rather pay an extra £35 or so for a brand new one.Heated anyway.